The reason is because image acquisition is one of the most under-talked about subjects in the computer vision field! Think about it. Whether you’re leveraging machine learning to train an image classifier, building an image search engine to find relevant images in a collection of photos, or simply developing your own hobby computer vision application — it all starts with the images themselves. And where do these images come from? Well, if you’re lucky, you might be utilizing an existing image dataset like CALTECH-256, ImageNet, or MNIST. But in the cases where you can’t find a dataset that suits your needs (or when you want to create your own custom dataset), you might be left with the task of scraping and gathering your images. While scraping a website for images isn’t exactly a computer vision technique, it’s still a good skill to have in your tool belt. In the remainder of this blog post, I’ll show you how to use the Scrapy framework and the Python programming language to scrape images from webpages. Specifically, we’ll be scraping ALL Time.com magazine cover images. We’ll then use this dataset of magazine cover images in the next few blog posts as we apply a series of image analysis and computer vision algorithms to better explore and understand the dataset. I actually had a bit of a problem installing Scrapy on my OSX machine — no matter what I did, I simply could not get the dependencies installed properly (flashback to trying to install OpenCV for the first time as an undergrad in college). After a few hours of tinkering around without success, I simply gave up and switched over to my Ubuntu system where I used Python 2.7. After that, installation was a breeze. Note: This next step is optional, but I highly suggest you do it. Scrapy should take a few minutes to pull down its dependencies, compile, and and install. If you get an import error (or any other error) it’s likely that Scrapy was not linked against a particular dependency correctly. Again, I’m no Scrapy expert so I would suggest consulting the docs or posting on the Scrapy community if you run into problems. If you’ve used the Django web framework before, then you should feel right at home with Scrapy — at least in terms of project structure and the Model-View-Template pattern; although, in this case it’s more of a Model-Spider pattern. This setting will activate Scrapy’s default file scraping capability. Again, feel free to add this setting to the bottom of the settings.py file — it doesn’t matter where in the file you put it. title : The title of the current Time magazine issue. For example, this could be “Code Red”, “The Diploma That Works”, “The Infinity Machine”, etc. pubDate : This field will store the date the issue was published on in year-month-day format. file_urls : The file_urls field is a very important field that you must explicitly define to scrape binary files (whether it’s images, PDFs, mp3s), etc. from a website. You cannot name this variable differently and must be within your Item sub-class. files : Similarly, the files field is required when scraping binary data. Do not name it anything different. For more information on the structure of the Item sub-class intended to save binary data to disk, be sure to read this thread on Scrapy Google Groups. Lines 2-4 handle importing our necessary packages. We’ll be sure to import our MagazineCover data object, datetime to parse dates from the Time.com website, followed by scrapy to obtain access to our actual spidering and scraping tools. name : The name of our spider. The name should be descriptive of what the spider does; however, don’t make it too long, since you’ll have to manually type it into your command line to trigger and execute it. 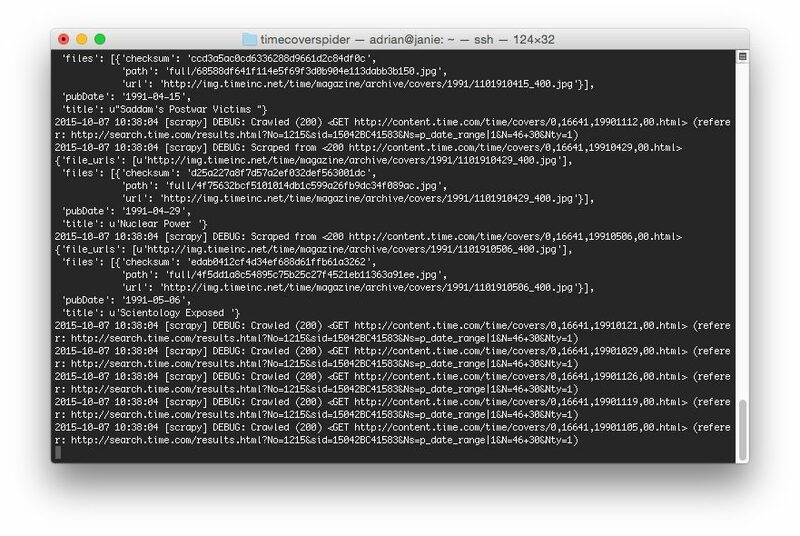 start_urls : This is a list of the seed URLs the spider will crawl first. The URL we have supplied here is the main page of the Time.com cover browser. 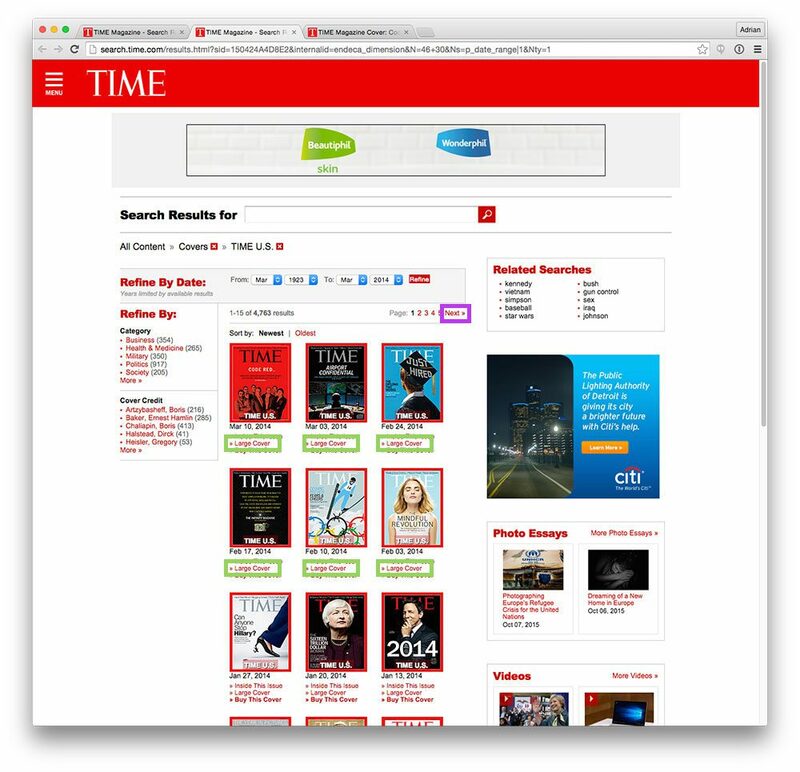 Figure 1: The first step in our scraper is to access the “TIME U.S.” page. 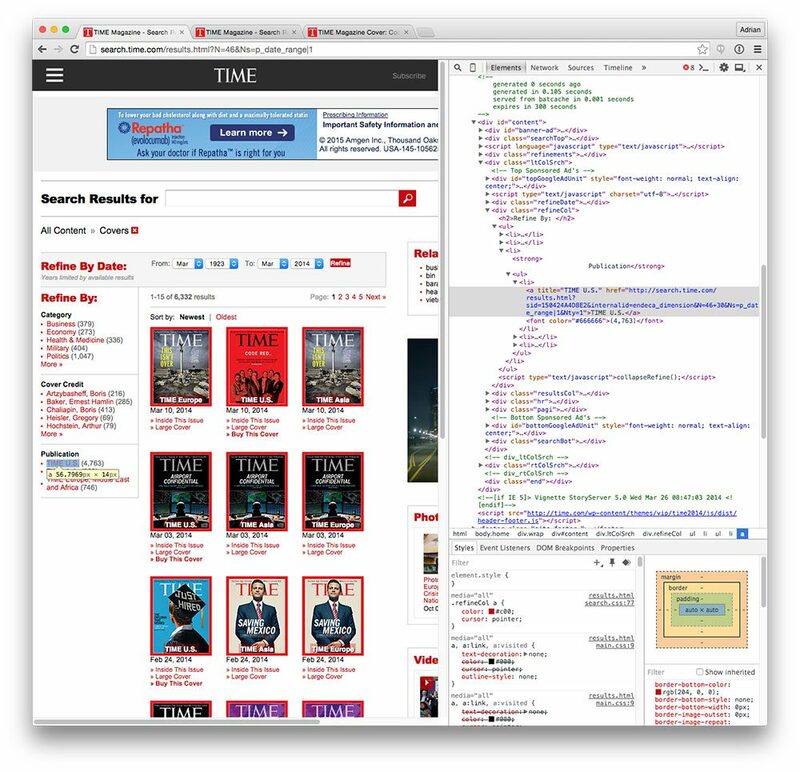 Figure 2: Utilizing Chrome’s Developer tools to navigate the DOM. Now that we have the URL of the link, we yield a Request to that page (which is essentially telling Scrapy to “click that link”), indicating that the parse_page method should be used to handle parsing it. Figure 3: On this page we need to extract all “Large Cover” links, followed by following the “Next” link in the pagination. Goal #1: Grab the URLs of all links with the text “Large Cover” (highlighted in green in the figure above). Goal #2: Once we have grabbed all the “Large Cover” links, we need to click the “Next” button (highlighted in purple), allowing us to follow the pagination and parse all issues of Time and grab their respective covers. We start off on Line 19 by looping over all link elements that contain the text Large Cover . For each of these links, we “click” it, and yield a request to that page using the parse_covers method (which we’ll define in a few minutes). Then, once we have generated requests to all cover pages, it’s safe to click the Next button and use the same parse_page method to extract data from the following page as well — this process is repeated until we have exhausted the pagination of magazine issues and there are no further pages in the pagination to process. Figure 4: On the actual cover page, we need to extract the issue title, publish date, and cover image URL. Just as the other parse methods, the parse_covers method is also straightforward. Lines 30 and 31 extract the URL of the cover image. Lines 33 grabs the title of the magazine issue, while Lines 35 and 36 extract the publication year and month. However, the publication date could use a little formatting — let’s create a consisting formatting in year-month-day . While it’s not entirely obvious at this moment why this date formatting is useful, it will be very obvious in next week’s post when we actually perform a temporal image analysis on the magazine covers themselves. Finally, Line 44 yields a MagazineCover object including the title , pubDate , and imageURL (which will be downloaded and stored on disk). 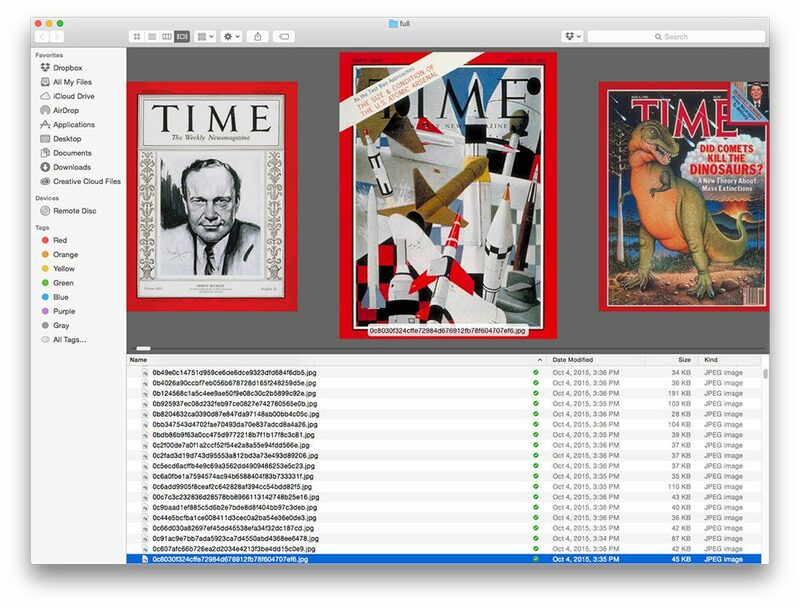 This will kick off the image scraping process, serializing each MagazineCover item to an output file, output.json . The resulting scraped images will be stored in full , a sub-directory that Scrapy creates automatically in the output directory that we specified via the FILES_STORE option in settings.py above. Figure 5: Kicking off our image scraper and letting it run. On my system, the entire scrape to grab all Time magazine covers using Python + Scrapy took a speedy 2m 23s — not bad for nearly 4,000 images! 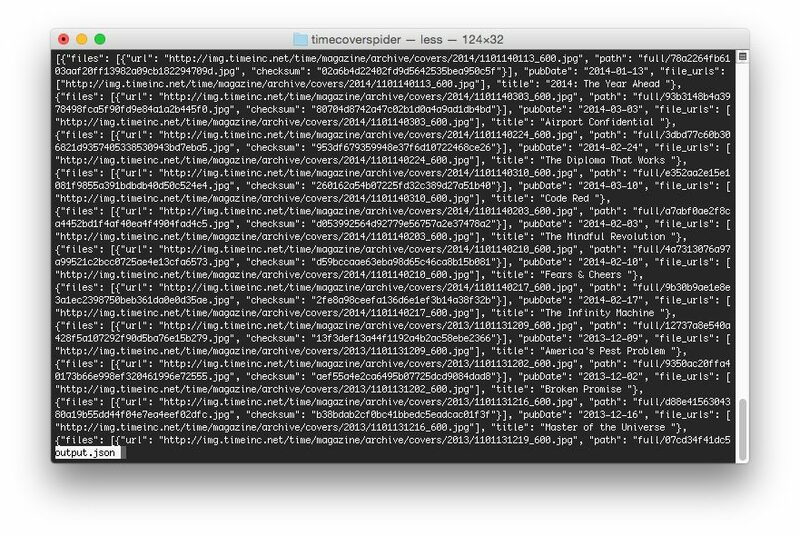 Figure 6: A screenshot of our output.json file. As we can see, we have scraped a total of 3,969 images. Figure 7: Our dataset of Time magazine cover images. I’ll be answering that question over the next few blog posts. We’ll be spending some time analyzing this dataset using computer vision and image processing techniques, so don’t worry, your bandwidth wasn’t wasted for nothing! Note: If Scrapy is not working for you (or if you don’t want to bother setting it up), no worries — I have included the output.json and raw, scraped .jpg images in the source code download of the post found at the bottom of this page. You’ll still be able to follow along through the upcoming PyImageSearch posts without a problem. 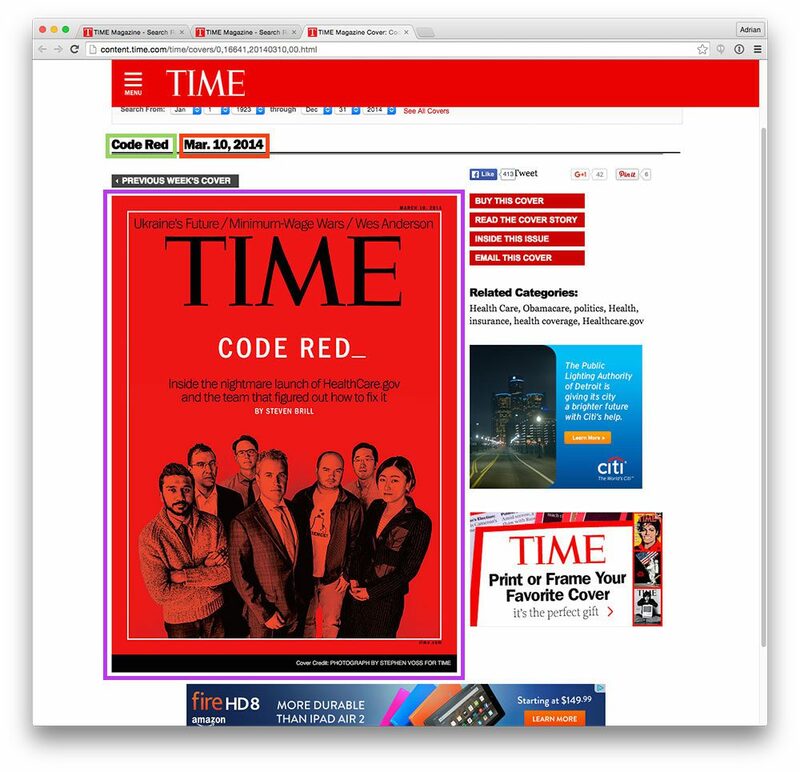 In this blog post we learned how to use Python scrape all cover images of Time magazine. To accomplish this task, we utilized Scrapy, a fast and powerful web scraping framework. Overall, our entire spider file consisted of less than 44 lines of code which really demonstrates the power and abstraction behind the Scrapy libray. So now that we have this dataset of Time magazine covers, what are we going to do with them? Well, this is a computer vision blog after all — so next week we’ll start with a visual analytics project where we perform a temporal investigation of the cover images. This is a really cool project and I’m super excited about it! Be sure to sign up for PyImageSearch newsletter using the form at the bottom of this post — you won’t want to miss the followup posts as we analyze the Time magazine cover dataset! Compared to Scarpy, i felt the ‘Beautiful Soup’ library (along with Requests module) an easier tool for scarping images from websites. For small projects, yes, you’re absolutely right. But Scrapy has a ton of extra features that you would have to manually implement when using BS4. For example, Scrapy handles multi-threading so you can have multiple requests being sent and processed at the same time. Scrapy handles all of the frustrating “connection timeouts” or when a page doesn’t load properly. Scrapy also handles serialization of the results out of the box. Overall, Scrapy can be overkill — or it can be just right for a large enough project. Is this based on the article I mailed to you? Glad you thought it was interesting, love the site. This is superb, enjoy building it whit you. I can now play whit SQLAlchemy and postgresql. Woah, any chance you’ll end up releasing this dataset? Apparently Apple has discontinued the use of openssl in favor of its own TLS and crypto libraries. 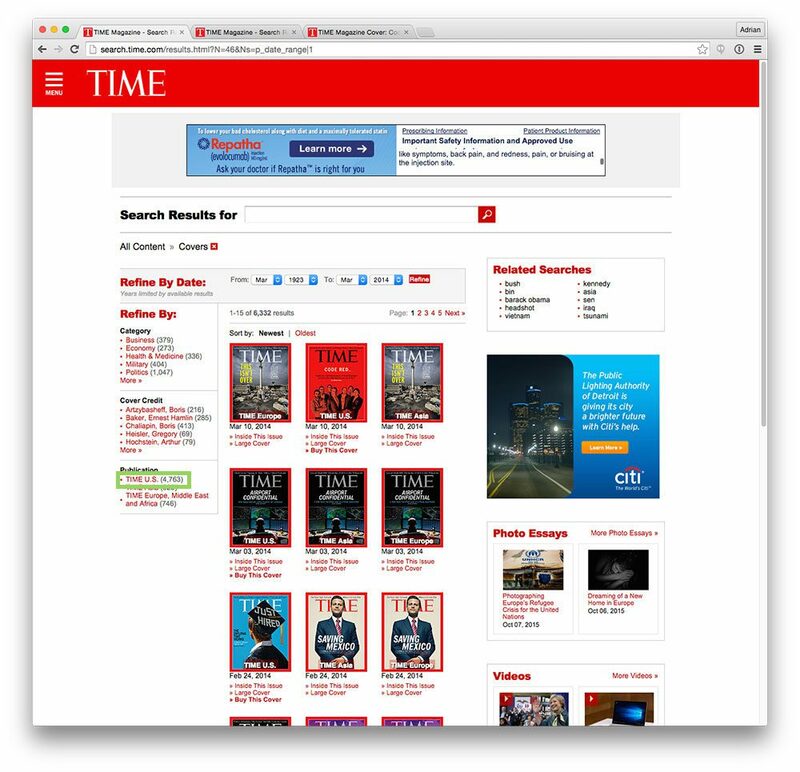 Was able to create and run the Time Magazine cover scraper on my Mac. is able to execute the web crawler. Loved the beauty of this article!!! Very to lucid, easy to understand and to the point. All you need is the yield keyword. You want to yield an object for each request or each image that is being saved. The specific logic and how the code needs to be updated is really dependent on your application. Is there a way to solve this? Would really love to try this out. Hey Adrian, great post again, but I think that the url for the Time mag covers is broken. Just tried scraping it..
That is certainly possible if the Time website changed their HTML structure. Also how did you get the output/full directory and also call up that snazzy viewer??? The output/full directory of images was obtained by running the scripts. I’m not sure what you mean by the “snazzy viewer”, but that is just a built-in file previewer in Mac OS. Excelent Post Adrian! There´s a way to capture images with a resolution in particular? The idea is capture all ecommerce product pages that doesn´t contains photo. The problem is that this image (no photo) dont have any pattern in css or xpath to capture, only the resolution. It´s possible to crawl onlythese images with scrapy? You would basically need to find all img tags in the HTML, loop over them, and check to see if the image meets your criteria. How I do that? Could you give me a little snippet to do it capture image resolution? While I’m certainly to help point you in the right direction, I cannot write custom code snippets. If you’re new to Python or the world of computer vision and image processing, I would suggest you work through my book, Practical Python and OpenCV to help you learn the basics. Thanks Adrian, I made a custom copy of this code but the images files aren`t saving on folder taht I indicated on settings. Wich could be the problem? Hi Nicolás — without knowing the page structure of what you’re trying to scrape or more details on the project, it’s hard to say what the exact issue is. Also, please keep in mind that this is a computer vision blog so scraping tutorials such as these are often just supplementary to other, more advanced projects. If you are having problems with Scrapy, I would suggest posting on the Scrapy GitHub or asking a specific Scrapy-related question on StackOverflow. Sorry I couldn’t be of more help here! Excelent Post Adrian! Many Scrapy conventions changed since this post. Could yo do an update with last Scrapy updates (end Time site too). It`s is the most useful post I read! I will certainly consider it; however, keeping this tutorial updated to reflect any changes Time makes to it’s DOM would be quite the undertaking. If others would want to help update the code I would consider it. Time has updated their DOM so the spider doesn’t work anymore. I spent about 2 hours trying to tweak it to work but I can’t so I have to bow-out from here. One link that works is http://content.time.com/time/coversearch/ but the XML elements are different so the code has to be re-written. Like I said, I spent about 2 hours unsuccessfully so I’m moving on to another tutorial. This one did work at one point, though. I’m sorry to hear you spent the time trying to update the code, but with 200+ tutorials on the PyImageSearch blog I cannot keep every single one of them updated, especially those that require external resources that I do not control (such as the DOM of the website). In these cases I kindly ask readers to share their solutions in the comments form. Learning something. Recently I have used ScrapeStorm(www.scrapestorm.com) to scrape image to my pc, and have a good effect. I think it will help many people. I love your work and your blog posts. Amazing how the covers have evolved through the centuries.